Andrew Feffer is a Professor of History and Co-Director of Film Studies at Union College in Schenectady, NY. He is currently writing a book on the impact of the Rapp-Coudert investigation on the intellectual life of New York City. In the fall of 1940 through the winter of 1941, as Europe passed into the second year of world war and the nation slowly climbed out of the Great Depression, faculty, students and staff from New York City’s municipal colleges were called before a tribunal of the New York State Legislature investigating Communist subversion. Before it was done in spring 1942, the Rapp-Coudert investigation, as this witch-hunt was called, had stripped dozens of people of their jobs, careers and reputations. Pearl Harbor had not yet happened. The Cold War would not start for another seven years. And yet something resembling “McCarthyism” had already begun. At the time, few legal safeguards stood between academics and the prying and prejudiced eye of such inquisitions, which were especially intense in New York, known for its concentration of left-wing movements. City employees suspected of membership in Communist organizations could be deposed in secret without a lawyer, fingered by undisclosed witnesses and denied access to the record of their own testimony or that of their accusers. Mere suspicion of communism entrapped academics in the Hobson’s choice between lying about their political affiliations and being forced to expose friends and colleagues under the threat of contempt charges. Many chose the former, and eventually got fired for it. Because of a clause in the city charter, they did not even enjoy the weak protection of the Fifth Amendment. While state laws required the city’s Board of Higher Education to conduct a hearing before dismissing tenured faculty, the many staff and untenured lecturers and tutors involved, not to mention students, could be fired or expelled without due process. 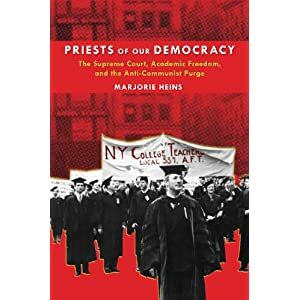 As Marjorie Heins, a civil liberties lawyer, writer, teacher and founding director of the Free Expression Policy Project, lucidly recounts in this excellent history of how the law has dealt with academic McCarthyism, at the time few courts, legislatures or academic institutions considered academic freedom a right protected under the Constitution. That situation only got worse in the wake of the war. In 1949, New York legislators, believing that “subversive propaganda” was being “disseminated among children in their tender years,” passed the Feinberg Law, requiring boards of education to dismiss any teacher belonging to an organization advocating the overthrow of the government by “force, violence or any unlawful means,” or having committed “treasonable or seditious acts or utterances.” Eventually, all teachers in New York’s public schools and universities were required to sign an oath denying any current or past affiliations with subversive organizations. Feinberg was not the first “test oath” to be wielded against political dissenters, but it was perhaps the most damaging. With its passage, an open season was declared on the state’s left-wing teachers and any other school employees suspected of harboring unpopular political views. It firmly established in law the principle of “guilt by association,” giving anti-communist inquisitors a simple tool with which to purge the state’s schools and universities. Hundreds fell before their tribunals. Why did the First Amendment not protect these teachers, virtually none of whom preached subversion in their classes and many of whom did nothing more than object to taking an oath? As Heins methodically shows us, the courts only slowly came to recognize the damage done by such inquisitions to individual rights and democratic institutions. Initially, the United States Supreme Court adhered to the principle bluntly enunciated by Justice Oliver Wendell Holmes in 1892 that “the petitioner may have a constitutional right to talk politics, but he has no constitutional right to be a policeman.” Following Holmes’s sharp distinction between the right to free expression and the privilege of holding a particular job or public office, through the 1950s Supreme Court majorities remained blind to the possibility that one might be used to limit the other. As one New York judge observed in 1949: “The issue is not whether there is a constitutional right to teach, but whether the ground asserted for denying this right or privilege, whatever it is, is one which is protected by the Constitution against legislative encroachment.” Yet, the Supreme Court rejected that judge’s reasoning, deciding in Adler v. Board of Education (1952) that loyalty laws like New York’s set reasonable standards for employment as a teacher or professor. It was in the public interest, the majority of justices argued, to block Communists at the schoolhouse door. As we know, Douglas was right. Heins briefly covers the climate of fear that spread across New York’s system of public education, not only stifling faculty and students on political issues, but also cramping their academic work and redirecting it away from controversial questions in their respective disciplines. According to philosopher Howard Selsam, forced to resign from Brooklyn College in 1941 after the Rapp-Coudert investigations, most of his colleagues remained “fearful even to be seen speaking to one who had been subpoenaed.” The inquisition’s real damage was not the destruction of individual lives or the loss to the academy of this or that talented teacher and researcher. It was “the effect of such purgations on those who remain[ed] -- timidity, servility, seclusion, pre-censored and self-censored teaching and research.” According to a study by Columbia University sociologists, the Cold War hysteria made 46 percent of social science faculty interviewed apprehensive about their teaching, writing and public statements. Some noted that they “toned down their writings,” others that they avoided controversy in class. One of the many virtues of Heins’s study is her emphasis on the collective costs of this lamentable record. Lots of people lost their jobs, to be sure, but far worse was the “narrowness of vision” the repression brought to our political and academic worlds. What a relief that must have been, yet how sad. For nearly thirty years, the fear described by Howard Selsam reigned over the American academy. Nor have such fears been put to rest. No sooner did the Keyishian decision come down than a reaction against it set in, and while the courts did continue shoring up some constitutional protections, they eroded or qualified others. This was especially true for primary and secondary public school teachers, whose official task of training students in civic values, while making them “priests” of democracy, also obliged them to follow curricular paths set by boards of education. Heins concludes, largely on the basis of anti-obscenity prosecutions, that “[b]y the turn of the century, the status of First Amendment academic freedom for professors’ research, writing, and teaching was increasingly shaky.” As the “war on terror” took over the new millennium, free speech and inquiry at the academy became shakier still. Most academics mistakenly believe that their academic freedom has been protected by the First Amendment since the writing of the Constitution. For them, McCarthyism was just a passing aberration, a paroxysm of hysteria directed by a drunken senator from Wisconsin. They should read this book. So should anyone with a stake in education, for not only is it a good read about an important subject, but Heins tells a cautionary tale of an extensive and durable problem of which they are probably unaware.